Enigmatic and introspective Donegal-based singer/songwriter Rosie Carney has released a slow but steadily captivating stream of singles since signing to independent record label X Novo in 2016, including the acutely personal ‘Awake Me’, which TGTF reviewed back in the early part this year. More recently, as we come to the close of 2017, Carney has unveiled a new track titled ‘Winter’, which captures both the fragile beauty of the upcoming season and the cold embrace of loneliness that sometimes accompanies it. Carney’s ‘Winter’ is a stark and exquisitely executed metaphor for a broken relationship. Musically, its delicate acoustic guitar and bowed string instrumentation creates an intricate and shadowy harmonic backdrop for her brittle yet graceful vocal lines. Lyrically, Carney mingles poetry that clearly recalls the characteristic darkness and biting chill of winter with lines that are equally evocative of despair and desolation, as in the opening verse of the song: “I watch the leaves fall down at midnight / there is no sound but humming streetlights / I feel the cold that sleeps on my back”. Contemplating a solitary life without her lover, Carney sings, “I’ll count the days until they’re longer / but who said this haze would make me stronger?” Despite the haunting spectre of doubt, her musical accompaniment does gather courage in its dynamics, as the distant piano melody adds a shimmer of light in the sonic background, and a faint dusting of backing vocals provides depth behind the lingering lyric melody, “I’ll try forgetting you . . .” The final violin melody wraps around to reiterate the song’s introductory motif, leaving behind a poignant sense of longing even after the last strains of sound fade away. ‘Winter’ from Rosie Carney is out now. Carney will perform in London’s Notting Hill Arts Club on the 12th of December as part of CRC Music Presents, along with Night Flight and a secret headline act to be announced later. TGTF’s previous coverage of Rosie Carney, including an interview with her from last year at SXSW 2016, is collected right back here. Ten years have passed since The Horrors first appeared like gothic misers of their own indie-dom. When you really process this it’s incredible to witness how far they’ve actually come. No band has quite relished in the idea of evolution more than The Horrors. Take, for instance, opener ‘Hologram’, which introduces the album with pulsating and swirling beats. The futuristic feel that you’ll find completely sweeps over the album is soon joined, in this instance, by jangled guitars, processed far from their natural sound. Frontman Faris Badwan soon joins in the party, with some seemingly heaven-sent vocals that truly embody the choruses repeated call of “are we holograms?” It’s a bright opener that wanders its warming way into seducing you for the rest of the album, particularly aided by the screeching and twinkling solo toward the outro, an aspect that repeats throughout. Following on, the droning piano that first teases in ‘Press Enter to Exit’ reveals nothing that the actual track contains. Once the first four bars have their say, it breaks into a far more groove-filled romp that carries you with its sway up. Until the chorus, which feels like a contained explosion into a new pop-tastic level. Once again, the bridge breaks down into a far more intelligible chaos that falls away, letting the silence build until exploding once more into a soaring solo. Earlier single ‘Machine’ greets us with an electronic drum pattern that runs rings around the sonic atmosphere. You can try and comprehend what’s going on but will ultimately fail. There’s an edge to the psychedelic sounds, one that brings a foreboding element that feels live one is being preyed upon. Filled with juddering sounds that oppose the melodic elements, it calls to mind a mechanical beast failing catastrophically. On a similar end of the scale, ‘Ghost’ goes for a more simplistic approach to the mechanical sounds. A slow tempo drum beat brings in Badwan’s singing, while distorted and flickering sounds eventually morph into a guitar line which completes its evolution from sparse wander into full-bodied orchestration. The eruption of sounds and noise at just over halfway feels apt. It’s as if the album had to be building to something and this is what the first half will always be: an eruption of sparkling sounds that both dazzle and confuse. From here, both ‘Point of No Reply’ and ‘Weighed Down’ break away from the metallic sounds. Instead, the Horrors go in a far more delicately melodic one that relies upon Badwan’s vocals to offset the beautifully sweet electronica elements. ‘Point of No Reply’ eventually leaves as peacefully as it came. ‘Gathering’ is perhaps the most natural sounding The Horrors get on this outing. Acoustic guitar and natural drums, with the occasional psychedelic slide, leaves a much more digestible sound. That is, until ‘World Below’. Kicking things back into a higher gear with a distorted array of crunching guitars and electronica, it’s the beginning of both the final stretch and some of the strongest cuts on the album. The other two that make up this final third flow perfectly. ‘It’s a Good Life’ reverts back to the slow and emotive approach. This builds towards the finale of ‘Something to Remember Me By’, a track that completely lets loose and breaks into dance territory. The fifth outing from Horrors mostly cements them as creators of their own future. They don’t relish being in the past. In fact, they stray as far away from their previous sounds as possible. No, the Horrors are are here to keep creating and evolving which, in all honesty, makes them one of the more exciting bands currently active. ‘V’. The Horrors’ fifth album, is out now on Wolf Tone / Caroline International. Our past articles here in TGTF are through this link. With light, ethereal instrumentation and Watson’s delicately introspective vocals, ‘No Fanfare’ doesn’t exactly soar, but instead gracefully floats through the listener’s sonic consciousness. That quality is surely intentional, and it seems remarkably appropriate to the song’s persistent lyrical examination of the ephemerality of relationships. “What chance have we got / when the flowerless sing of flooded orchards?”, Watson sings over a strummed acoustic guitar and a wash of amorphous synths. His lyrics straddle the line between poetry and prose, often blending indistinctly into the soundscape. But musically, his idea still comes across. The synths adopt a mild wail of sorrow ahead of the pleading question “was it the cool mountain air / making your mind feel calm and empty / or was it the absence of myself?”. The addition of brass halfway through the song brings a hint of richness and warmth to the sonic texture, and a gorgeous electric guitar solo injects an air of poignant longing before the track comes around to close, as if at peace, back where it began. ‘No Fanfare’ is out now on Moshi Moshi; take a listen to it just below. You can read our past coverage of Charles Watson as part of Slow Club through this link. Dorset singer/songwriter Roo Panes has recently released his first taste of new music since his 2016 album ‘Paperweights’, in the form of a standalone single titled ‘A Message to Myself’. The new track takes a slight step away from Panes’ previous guitar-based songwriting style, which I had described as “earthy” and “organic”, and expands his sonic palette to encompass a more atmospheric, almost ephemeral quality. ‘A Message to Myself’ starts with an ethereal “ooo” over a simple piano accompaniment, before Panes’ deep yet effortless baritone enters. His lyrics are poetic in form and a bit obscure in meaning, but his self-directed message seems to be about finding clarity and peace in the solitude of his own mind, away from the influence of the outside world. “If I’d heard every word / or read every line upon the shelf”, he sings in the title lyric, “I’d still need a message to myself”. Though it consists only of two verses and a simple refrain, the song spans over 5 minutes in length without ever losing its gentle but steady momentum. Produced by Bassi Fox of Mt. Wolf, the subtle instrumental details in the arrangement set an ambient, introspective tone as well as adding hints of texture and color to the overall soundscape. The falsetto vocal in the refrain will appeal to fans of Bon Iver singer Justin Vernon, and Panes uses his naturally melodic singing voice as a deftly integrated part of the instrumental texture in the song’s lengthy and delicately layered coda. Roo Panes’ newest single ‘A Message to Myself’ is out now on CRC Music. Talented photographer Sophie-Emma Rider has published a series of photos of the equally talented and remarkably photogenic Roo Panes on her own Web site, which you can find by clicking here. TGTF’s previous coverage of Roo Panes, including a lovely interview from SXSW 2016, is collected through here. Aussie alt-rocker and SXSW 2017 alum Alex Lahey’s debut LP ‘I Love You Like a Brother’ has been out over a month now, but the consistency and quality of both the singing and the songwriting on the album indicate that it, and Lahey herself, might just have some staying power. The style of the songs, on the whole, is an engaging combination of garage rock and twee indie pop, in which Lahey finds just the right ‘cool girl’ vibe between catchy guitar riffs and smart, deceptively astute lyrics. Opening track and early hit single ‘Everyday’s the Weekend’ packs an immediate punch with its driving guitar rhythm and sharply punctuated lyrical phrases. Lahey’s vocal is both seductive and mildly sullen as she describes an illicit relationship in the verses (“you’ve got things like a family / they’re a bigger deal than I’ll ever be”), and tempts her lover to throw caution to the winds in the catchy chorus, “don’t know, don’t care / every day’s the weekend”. 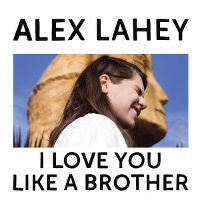 ‘I Love You Like a Brother’ is even more uptempo and energetic, carrying Lahey’s devil-may-care attitude into an ode to sibling solidarity. The chorus message is stone simple, “I love you like a brother / just like I oughta”, but the verses display an agile wit in lines like “from the same divorce and from the same wedding / we couldn’t help that marriage ending” and the musical treatment is infectious from start to finish. Lahey takes a more serious tone in the opening lyrics to ‘Perth Traumatic Stress Disorder’, “Perth is lucky that she’s pretty / otherwise I’d hate that city / the only place my heart’s been torn in two”, but her sharp cynicism is a perfect match to the fuzzy guitars and pounding drums, and the lightly floating “oohs” at the end of the song keep it from being weighed down in despair. The tempo and dynamic levels back off a bit in ‘I Haven’t Been Taking Care of Myself’, and here Lahey’s singing voice starts to make its presence known. ‘Backpack’ is even slower and more stripped back, with light, gently sung vocals matched to a bright and pervasive guitar riff. Lahey wisely avoids the kind of vocal contortions that make many female pop/rock singers unlistenable, depending instead on her natural tone and writing melodic lines that suit the sweet clarity in her upper register. Recent single ‘Lotto in Reverse’ gets back to a grittier rock sound and more deliberately strident vocal, which aptly matches the jaded bitterness of Lahey’s lyrics. She deftly segues to a mood of languid ennui in ‘Let’s Call It a Day’ before closing the album with the delicately sad and exquisitely sung ballad ‘There’s No Money’. Though Lahey’s quick-witted lyrics and impossibly catchy guitar lines are the first aspects of this album to make their mark, it’s ultimately the flexibility and subtle inflections of her singing voice that have a lasting impact. ‘I Love You Like a Brother’ covers a lot of emotional territory in its themes, and Lahey adeptly uses both her voice and her guitar to execute her full range of desired effects. The album is vivacious and fun, but it has an underlying intelligence and wit that belies Lahey’s relative youth. Alex Lahey’s debut LP ‘I Love You Like a Brother’ is out now on Dead Oceans. Lahey is set to embark on a handful of UK shows at the end of this week before heading to North America. You can find details on all of her upcoming live dates on her official Facebook. Read more about Alex Lahey on TGTF through this link. BANNERS – known to his mum back in Liverpool as Mike Nelson – has had a busy 2017. Building on the momentum of last year’s self-titled EP, he’s released a slew of singles this year, including ‘Firefly’ (which I reviewed back here) and ‘Someone to You’, a recent mainstay at SiriusXM’s Alt Nation. ‘Someone to You’ has some interesting lyrical choices, as it is alternately self-deprecating and inspiring. It comes across as genuine as the figurative ticker tape that runs in all of our hearts: feeling a host of emotions all at once, and not a singular one, is as normal and human as it gets. The song is a wonderful foot-stomper, with an incessant, irrepressible beat, and lyrics that beg to be sung along to. The literal translation of the song’s title is the want to be important to someone else, as in the shoulder to cry on and the rock when things get tough. In conventional, straight relationships, the man is supposed to be in the role of provider and protector, the strong one. With the words in the chorus “and if the sun’s upset and the sky goes cold / then if the clouds get heavy and start to fall / I really need somebody to call my own”, he is stepping up to the plate to be that protector. However, Nelson also recognises that in a relationship, there should be reciprocal give and take. He’s ready to be vulnerable, to be led to a better place by a strong partner: “And if you feel the great dividing / I wanna be the one you’re guiding / ‘Cause I believe that you could lead the way”. I’d like to highlight Nelson’s reliquishing of the lead role in a relationship, because it seems to be in recognition of something much bigger than the two people in a committed relationship in this song. He’s acknowledging that we’re here on this green earth not to be self-centred, selfish and completely absorbed in material things and in our own lives. We’re here to be kind, to do for others, for a greater purpose and to affect positive change even when the times get rough and to make a difference to others. Have you sensed a recent shift in how you’re feeling lately? Some of us are already actively working on this. I don’t think I need to convince you with the refugee crisis, the election of President Trump, the Brexit vote to leave the EU, the armed response to the Catalonia referendum, the numerous senseless acts of violence that have killed so many people, the list goes on and on…there are a lot of angry people and people hurting in this world right now. You need to decide if you’re going to join the movement to make this a better place or if you’re going to sit back and do nothing. And the ending of this video! You’ll never guess what happens at the end, so make sure you watch it all the way through. Please share it: it’s a video that is sure to raise a smile and hopefully make a difference in someone’s life. ‘Someone to You’ and the EP that it’s on, ‘Empires on Fire’, are out now on Island Records. For more on BANNERS here on TGTF, check out all of our coverage on him through here.